This is such great Power Girl Moment from issue #21. It’s actually the very first page and it’s just one of my all time favorite series of panels. 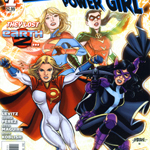 It so shows off Power Girl’s imperfect side in such an amazingly real way. I love it! 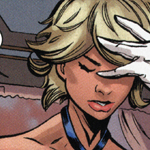 This series of frames preceeds some story telling about her getting in a fight with Superman, but that she was actually hallucinating and beating up Captain Atom. She was hallucinating due to some evil scheming on the part of Max Lord. This whole issue is actually a great read with quite a few amazingly awesome Power Girl moments – this series of frames being one of them. The second frame is hilarious, “‘Congradulations’? What -- you think I’m pregnant?! Excuse me that we all can’t be a size 6!” I think everyone’s done that kind of thing before — totally biffing it on their interpretation of a situation, and in a royal way. And then in the third frame, getting changed somewhere and being caught off guard, like, “OMG!” But of course if she was caught off guard, she could move at super-speed to disappear in a flash. Maybe this frame is a bit off though, because with Power Girl’s super senses, could she really be caught off guard by mere humans? Maybe not! lol! It is such a marvelous and such a real feeling image though. Both her and the window washers were caught off guard, simulaneously realizing the other was present! 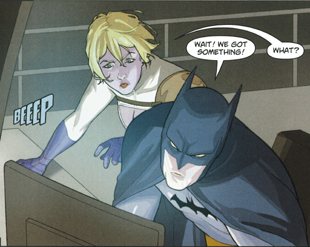 The forth frame is such phenomenal dialogue with Power Girl and Nicco arguing about reinforcing the door – so great! It’s funny that she puts him to work doing things like reinforcing doors. Maybe she wanted the doors reinforced so she’d have a place she could let her hair down and not have to “pull her punches” all the time — including when opening and closing doors. 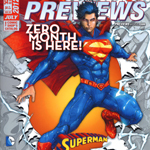 For Kryptonians, with their super-duper strength, opening and closing a door is maybe on a human level something like turning the delicate tissue paper covering an old photograph or artist’s sketch. It’s got to be a litle bit a burden at times having to be so careful, which led to the situation pictured. And the final frame is so great. It’s a close up of when she thinks she’s in a fight with Superman, but she’s not, and it makes her so sad that she’s in a fist fight with him. Awwwh. And the Judd Winick just nailed it so incredibly well, as usual, with the “bury the needle in the red on the screw up scale” line. 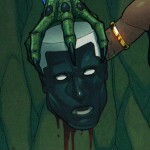 All of the images in this array are done so superbly well. Sami Basri so captures her emotion so perfectly in every frame. It’s so amazing. It’s like every one of them is so real for me. 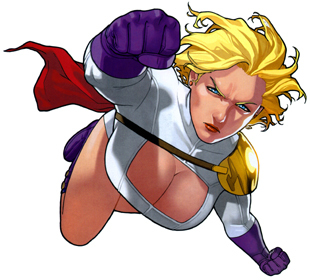 And that Judd Winick could capture – with an introductory page – the emotion of screwing up — I love Power Girl!!!! Or order #21 through www.amazon.com or another online retailer.